Details relating to the Austrian Commemorative of 2017. 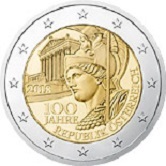 This coin commemorates the 100th anniversary of the founding of the Austrian republic. The motif for the coin shows, in the right side of the inner circle, the upper half of Pallas Athena. She is in front of the Austrian parliament, which vaguely resembles buildings in classical Greece. The parliament is in the background in the top right quadrant. Athena was the goddess of wisdom, standing for wisdom and reason and I suppose the idea is that these will be characteristics of the Austrian parliament! Around the edge of the inner circle from seven to two o’clock is the inscription “REPUBLIK ÖSTERREICH”. The year of issue is at nine o’clock and just in from eight o’clock is the inscription “100 JAHRE”. Return from Austrian Commemorative 2017 to euro coin collector.